Event carried out in secret due to threat of Taliban strikes in Afghan capital, which has been hit by repeated bombings. NATO has held a ceremony in Kabul formally ending its war in Afghanistan, officials said, after 13 years of conflict and gradual troop withdrawals that have left the country in the grip of worsening conflicts with armed groups. The event was carried out on Sunday in secret due to the threat of Taliban strikes in the Afghan capital, which has been hit by repeated suicide bombings and gun attacks over recent years. On January 1, the US-led International Security Assistance Force (ISAF) combat mission will be replaced by a NATO “training and support” mission. “Resolute Support will serve as the bedrock of an enduring partnership” between NATO and Afghanistan, Campbell told an audience of Afghan and international military officers and officials, as well as diplomats and journalists. He paid tribute to the international and Afghan troops who have died fighting in the conflict saying: “The road before us remains challenging but we will triumph”. The closing of NATO’s combat mission comes at the end of the country’s deadliest year during the war, which saw at least 4,600 Afghan soldiers and police killed and many other civilian deaths. About 12,500 foreign troops staying in Afghanistan will not be involved in direct fighting, but will assist the Afghan army and police in the battle against the Taliban, who ruled from 1996 until 2001. 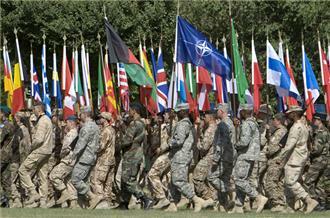 When numbers peaked in 2011, about 130,000 troops from 50 nations were part of the NATO military alliance. A NATO official said US General John Campbell, the ISAF commander, would lead Sunday’s ceremony at the force’s headquarters in Kabul. “In just a few days, our combat mission in Afghanistan will be over,” US President Barack Obama said in his Christmas Day address. “Our longest war will come to a responsible end”. Sunday’s ceremony completes the gradual handover of responsiblity to the 350,000-strong Afghan forces, who have been in charge of nationwide security since the middle of last year. Al Jazeera’s Jennifer Glasse, reporting from Kabul, said that Afghans were very concerned with the complete pullout, citing a security vacuum and political instability as the main threats as heavy fighting rages across the country. “At the height of war there were 400,000 NATO troops across the country. We have seen the speed of the gradual withdrawal increase over the last couple of months. By the end of the year only 13 or 14,000 troops will be in Afghanistan,” she said. “The government has also failed to name a cabinet, so it is not just the lack of security that is a concern, but also political instability”.